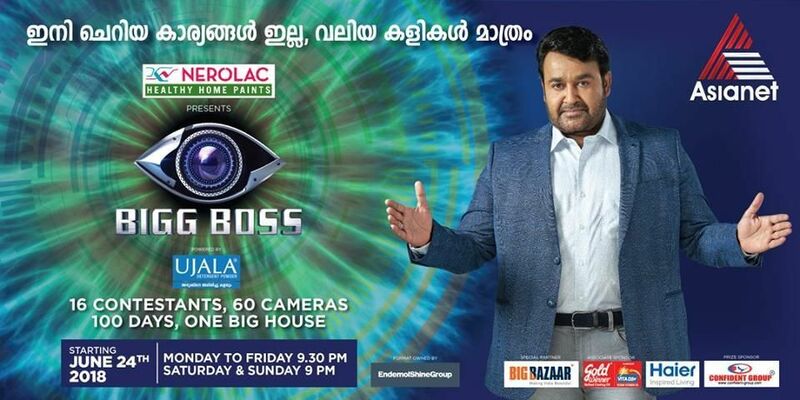 Bigg Boss, the world’s biggest reality show, has been broadcast on Asianet, host by Super star Mohanlal. He presented 16 competitors in Big Boss on June 24 in a lucrative launch episode.Swetha Menon, Ranjini Haridas, Sreelakshmi Sreekumar, Anoop Chandran, Tharikida Sabu, Hima Shankar, Pearly Maney, Archana Suseelan, Adhithi Rai, Srinish Aravind, Deepan, Diya Sana, Manoj Verma, Basheer, Aristo Suresh and David John are some of them. Crisis and obvious perspectives come to the fore in front of Malayalees. The participants will be completely cut off from the outside world they will have no access to internet, phones, television or newspapers. With no way out to distract themselves, each participant will have to compete with others inside the house to complete various tasks.They will be tracked and monitored by 60 robotic & manned cameras continuously. The lavish ‘Bigg Boss’ house will have all necessary comfort to stay for 100 days. Asianet telecast “ Big Boss “ on every Monday to Friday at 9.30PM and Saturdays and Sundays at 9PM. we have updated the complete list of participants of the show. Hotstar app will stream latest episode of the show after it’s original telecast.